Long-separated brothers, Jim and Jack Parsons, found each had attended the same Grace Brethren church for many years and their paths had never crossed. 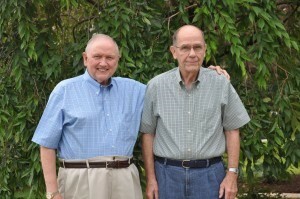 Jack and Jim Parsons have been long-time members of the Grace Brethren Church in Columbus, Ohio. Jack, 81, and his wife, Ann, and their family began attending the church in the mid-1970s. They had moved to Columbus in 1974 when Jack was transferred there with the U.S. Postal Inspection Service. After he retired at age 55, he worked 1o years in the church copy center, overseeing the printing of bulletins, newsletters, and other materials. Jim, 76, and his wife, Lee Ann, and family, had moved to the Columbus suburb of Worthington, Ohio, in 1979 when Jim, a long-time hospital administrator, began the first hospice program in Columbus. They purchased a home on Schrock Road, just doors from the Grace Brethren Church building, which currently is known as the South Campus. Over the years, they attended the church off and on, but formally joined the congregation 28 years ago. Though both Jack and Jim were involved in the church, their paths never crossed. That is not unusual in a congregation that has numbered more than 3,000. But their photos appeared next to the other in the church directories. Jack had been raised in Virginia by his paternal grandmother, Big Mom, after his parents separated when he was six years old. His coal-miner father died at age 37 of a heart attack. He never knew what happened to his mother, much less whether he had any siblings. Jim had been raised by his mother, who had moved from Virginia to southern Ohio to live near a sister when she separated from her husband. Another brother was born about five months after the move. Jim always knew he had an older brother named Jack and in 1968, he and Lee Ann began to search for him. The last place they knew he had lived was in Tennessee in the 1960s. At the suggestion of their son-in-law, Jim Mosic, the chief of police in Worthington, Jim and Lee Ann hired a private investigator earlier this summer to pick up the search. To their surprise, she called two days later with the news that she had found the long-lost brother and he lived within 20 minutes of their home. But then came the a-ha moment — the other Parsons family who attended the Grace Brethren Church. Indeed, Jack and Jim are biological brothers and they met, with their wives, Ann and Lee Ann, for the first time in late June at a local sandwich shop. Since that time, their families have connected and begun to build a bond. “I’m still in shock,” says Jack, his southern drawl bearing traces of his Virginia childhood. Jim, who searched for Jack more than 40 years, is most excited that his new-found biological brother is also a brother in Christ. The brothers may never know the reason for their parent’s separation (though the two never divorced) nor why their own separation was for so long. But both are quick to give God the glory now that they have been reunited. I love it! I too have seen both of these men at church but did not know they were family. However, I am thrilled to no end God has finally allowed them to be together. Thank you Lord!